Seilpark Engadin Sur En Sent - in the middle of the Lower Engadine Forest. The Rope Park in the Lower Engadine region, strung between spruce, larch and pine trees, offers both great and small adventures. Here you get the chance to experience a view of the forest from the tree tops, while rising to the challenges of the eight different courses, spanning a total length of more than 1,000 metres. Ideal as a day trip destination for the whole family. 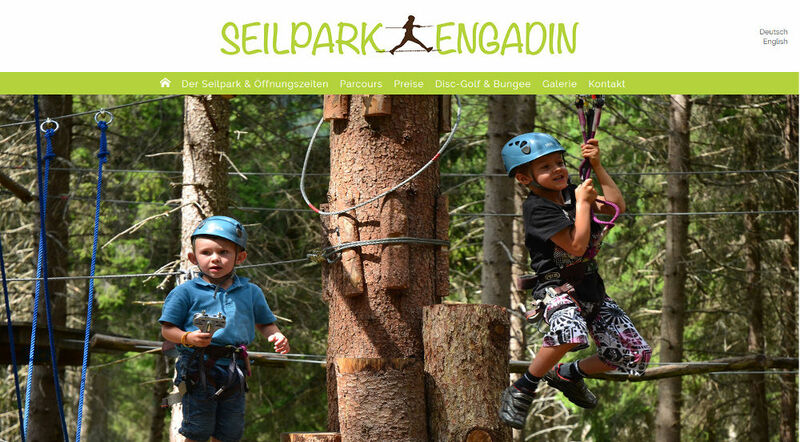 Engadin Rope Park consists of 8 eight different courses, each featuring a different height and level of difficulty. Located only one to two metres above the forest floor, the Tramblai and Sur En courses are ideal for our youngest visitors. The Uina course consists of more than 14 different elements at a height of two to three metres. The Quar course consists of 16 elements and is located four metres above ground, while the Sursass course is strung at a height of eight metres above the forest floor. Located at nine metres above ground, the Rims course is our most difficult one. The Sesvenna course is at a height of 12 metres above ground, and the Lischana course, consisting of several flying fox zip-lines at a height of 14 metres above the forest floor, offers you a thrilling experience. For further information, visit the website of the Rope Park.